Religion For Atheists by Alain de Botton | Shut Up Hamish! *I’d just like to note I’m not necessarily an Atheist and you don’t have to prescribe to such specific definitions of spirituality to enjoy this book. In the second chapter of Religion For Atheists, Alain de Botton compares the approach of education in the secular state to the religious approach to education. Talking about literature in either, de Botton raises the subject of how religion (Christianity in this case) understands the forgetful nature of people, using the term akrasia, “a perplexing tendency to know what we should do combined with a reluctance to actually do it, whether through weakness of will or absent-mindedness”. Due to this Christianity, which is primarily dedicated to educating people on how to improve their lives on an emotional level as opposed to secular education whose primary purpose is the imparting of facts, has set up a system where the lessons of christian text (the Bible) are constantly reinforced, be it in sermons, religious holidays or other ceremonial type things. De Botton raises the point that we could learn similar life changing lessons from secular classics, such as the work of Chekhov or particularly emotionally moving films. Often we leave the theater, cinema, or finish a book and feel like completely changing our lives based on the values in that text we have just experienced. But then the feeling fades and we go back to mundane life. So whether or not that was the key point of De Botton’s chapter, I’ve decided to combat that akrasia by writing more about everything I watch, read or listen to. May as well start with the book that inspired the impulse. Religion For Atheists argues the case that the secular world could learn a lot from religion. By largely rejecting elements of the main religions, the secular world, atheistic or not is allowing a lot of helpful ideas or activities that were in the past more general human concerns to be entirely claimed by religion. If we were to look for positively on religious things we might be able to improve the way the modern world works, de Botton argues, in areas such as community, art, education, kindness, architecture and institutions. 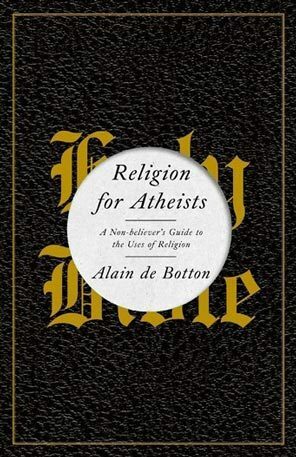 You may find many parts of modern religious dogma unappealing but de Botton successfully illuminates the positive elements of religion, and in doing so creates a book that’s informative, eye opening and as helpful as any self help book. Several threads from de Botton’s other books are continued here, such as looking at modern consumer societies status obsessed society, and shows how religion can help us to ask the questions about our lives and souls to really improve our existence, beyond the temporary fix that is chasing material possessions or satisfying shallow urges. De Botton uses this humanistic kind of outlook to appeal to people who have no interest at all in religion and couldn’t put even a slight belief in any deity. Regardless of how atheist or agnostic you are, it’s difficult not to relate to human creations, of which religion can be understood as one, which exist primarily to try and help people live their lives as best they possibly can. If you don’t get totally carried away and want to start integrating into your life secular versions of religious activities, the book also proves interesting as an overview of the many varied aspects of religion that the non-religiously inclined might not be immediately aware of. At times the book felt genuinely revelatory, either that or I’m just naive and like a sponge when it comes to reading about de Botton’s self-help pop philosophy. Particularly the section about Buddhist ceremonies and their purposes I found struck a chord. De Botton partakes in a Buddhist weekend retreat for novices; there he engages in activities such as breathing meditation, which he describes the purpose as being “to open up a modest distance between our consciousness and our ego”. It just resonated with me the perhaps obvious to others thought that there are cultures of the world entirely dedicated to such things as separating your ego from your experience, such as in this Buddhist way which seeks to show people how they can view the world as it is, being mindful of such things as the blood running through our veins, the wind against our cheeks and tiny little details of what is happening right now in the present. Ignoring self absorbed, ego driven concerns is not something the modern western world does very often at all, and being so surrounded by propaganda fueling our selfish insecurities, driving our material lusts, it is refreshing to join de Botton’s search in finding the parts of human culture that are dedicated to making the human experience better. His ideas may be commonsensical at times and perhaps over simplistic but I felt there was a lot of positive thought within the pages of Religion For Atheists. The last few chapters detail Art, Archeology and finally end up with a literature review of some of the other key idealists who have sought to reclaim religious ideas into some kind of secular church. It may not have happened yet but it’s good to know there’s thinkers out there willing to constantly challenge the capitalist modern machine and provide us with alternatives on how to better live our lives.